Welcome to Nelson and Nelson Antiques. 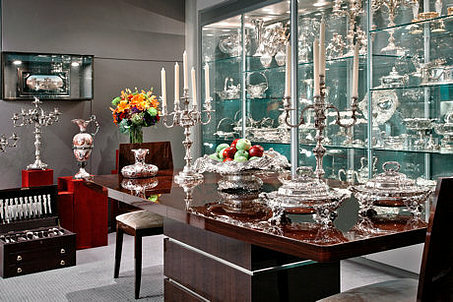 We are antique sterling silver dealers who have been serving New York City, New York for over 40 years. While you can shop for antique silver in our retail location, you can also select from our antique silver inventory online. At Nelson and Nelson, you will find one-of-a-kind antique sterling silver pieces, antique silver hollowware, and more dating back to the 1800s. We hope you enjoy our selection! As antique silver dealers, we are looking to buy and sell antique sterling silver gallery of sterling silver, antique silver, Chinese Silver , Tiffany Sterling and Antique Jewelry as well as Estate Jewelry in NYC. Click above on 'Catalog' to scroll through our complete selection of Antique Sterling Silver, silver hollwware, Antique Silver, Tiffany sterling silver, sterling flatware sets, sterling silver tea sets and coffee sets, sterling frames, silver overlay. Antique sterling,antique silver and antique jewelry is our specialty. At Nelson & Nelson we strive to maintain the most interesting pieces of sterling silver from the 19th century through the mid part of the 20th century. All of our items have been carefully cleaned and polished by the same silversmith for over 40 years, so you can expect only the best from Nelson and Nelson Antiques. All items on our web site have a full guarantee as to authenticity and age. If you receive an item and are not satisfied for any reason simply return for a full refund on your credit card. If you have any questions please contact me personally by phone or email. And don't forget to bookmark us as antique silver dealers in the NYC area. Our antique silver and antique jewelry inventory is always changing. We are actively buying and selling all types of sterling silver, estate silver, antique jewelry and estate jewelry. Click here to Sell Sterling Silver or Sell Estate Jewelry if you are interested in selling your antique jewelry or sterling silver. Nelson And Nelson is located at 1050 Second Ave Gallery 57, NY NY 10022 in New York City. Our hours are 11-5 Monday to Friday, or call us at 212-980-5825. Learn about sterling silver antiques, silver history, collecting tips and much more on our blog, Silver Antiques Insider.